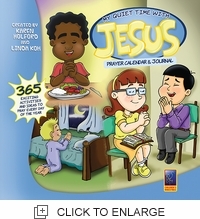 365 ideas and creative activities for praying every day of the year at home, church, or school. Very attractive material for children prepared by the Childrenï¿½s Ministries Department of the General Conference for children to discover the power of prayer and learn about Godï¿½s love. ï¿½ Journal for writing prayer requests and responses. ï¿½ Creative activities, Bible verses, puzzles. ï¿½ Full-color illustrations.